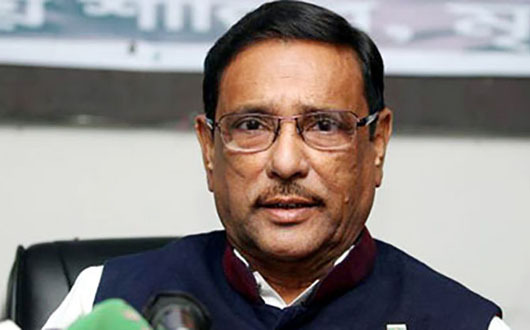 Awami League General Secretary Obaidul Quader on Saturday opined that BNP does not understand anything but power and such political parties are ‘disaster’ for Bangladesh. “Sheikh Hasina’s target is the next generation while BNP’s target is the next election. They (BNP) don’t understand anything except power”, Quader said. Obaidul Quader, also Road Transport and Bridges Minister, came up with the observation while speaking at inaugural programme of Bangladesh Awami League's Science and Technology Sub-Committee website at the Institute of Engineers, Bangladesh (IEB). Mentioning the recent quota movement and safe road protest the Minister said “Though common people of Bangladesh didn’t respond to any movement, some parties and media spread rumours to stir up the protests to different directions and confuse public”. Today’s initiative (website inauguration) is an effort to stand against such propaganda, he also said. Quader accused BNP of disparaging the country and complaining before the United Nations after losing public trust. “If you have any complaint then share it with public, how can a party have such narrow mentality? Is our country like Syria or Sudan that we have to go to United Nations?” he asked. Chairman of Bangladesh Awami League's Science and Technology Sub-Committee, Md Abdus Sobur, IEB President Md Abdus Sobur, member of Bangladesh Awami League's Science and Technology Sub-Committee Taizul Islam MP also spoke on the occasion.